Q. Do you guys have a paper catalog? A. This is by far our most frequently asked question, with dozens of phone calls a day! Unfortunately, at this time we do not have a paper catalog. While we may venture there in the future, it is not our intent to have one anytime soon. We try to make our websites (especially this new one) as easy as possible to shop from. Q. How long has Traditions been open? A. We officially opened in 1994 – thank goodness just a few months after the devastating earthquake hit here in Los Angeles. See below for a more detailed answer! Q. What inspired you guys to start Traditions? A. Our family has always loved the holidays, family vacations centered around traveling the western United States and visiting all of the Christmas stores and bakeries in every town! At that time we owned a grocery store (Gary's Market), and for five years before we opened Traditions, we 'tested' the market, to see how selling holiday decorations would work in our city. We brought holiday decorations into our grocery store in October, clearing out a few aisles and loading them up with Christmas decor...even things that our family hand made! The response from our local customers was overwhelming and we sold out each year! Q. How large is your store? Q. How would you describe your product mix? A. We are a year-round holiday store, featuring all the major holidays every day in our store and online through our website...it is rare that we don't sell something from each holiday either online or in our store EVERY day. We began our business as an antique and year-round Christmas store, within a few months we saw an opportunity in featuring all holidays every day in our store, so we narrowed our focus and committed 100% to every holiday 365 days a year! We set out to be the source for everything our customers would want for all of the major holidays! We concentrate on Valentine's Day, St. Patrick's Day, Easter, Patriotic holidays, Halloween, Thanksgiving, Christmas and Hanukkah. The fastest growing holiday is Halloween, but in terms of total volume sold for a holiday, nothing beats Christmas (especially since Christmas items can be bought for personal decor or for gifts!). Q. Do your products look the same as they do in the photos? A. Yes! We photograph almost all of our products ourselves... It's a lot of work, but we feel that our customers should see exactly what they are going to get. We could, potentially use photos provided by our manufacturers; however, these photos are often heavily manipulated and do not accurately represent the products we receive. We strive to keep both ourselves and our customers happy, and the last thing we want to do is deceive our customers! So if you see our logo on a product image, you can rest assured knowing that we photographed the item ourselves. Q. How many employees do you guys have? A. We currently have eight, four of us are family and the rest may as well be! Five of us have been running the show since the beginning. Q. How do you guys manage your site? First off this site is completely designed & managed in house... impressive right?! It has literally taken us years to get our site this far – building an e-commerce website with an inventory as large as ours and with products as large as ours is no easy feat! Our site is built using the MIVA platform. Debi (the wonderful owner of Traditions), Tyler and Alex manage all of the content you see on this site, from product additions and descriptions to our blog. While Ryan does all of our coding, web design and product photography. Q. Do you do any special events at the store? A. Yes, we have at least one artist signing event a year, usually the first weekend of October. Subscribe to our email list or contact us to find out when we're having our next event! Q. Where do you find your products? A. 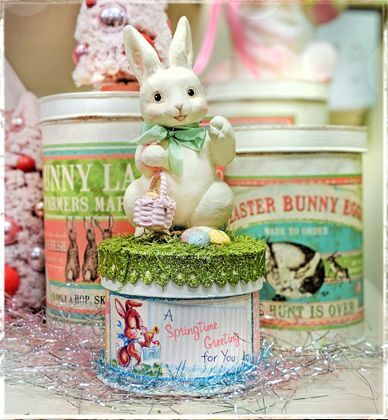 At Traditions, we tend to carry items that reflect a time gone by, we absolutely love vintage decor for every holiday! So finding unique vintage folk art and ornaments can be a challenging task; we travel around the country two to three times a year searching for new product. The process is difficult, and needless to say we can't share all of the details with you. But, rest assured knowing that we try very hard to carry the best decor around! Aside from finding the best manufacturers we also deal with folk artists directly, carrying a large amount of hand made folk art decor. If you're a folk artist and would like to see if we're interested in your products give us a call or drop a message on the Contact Us page!